Reps. Jimmy Panetta, D-Calif., left, Mike Bishop, R-Mich., and Hannah Shaw celebrate. ARS stands for Agricultural Research Service. 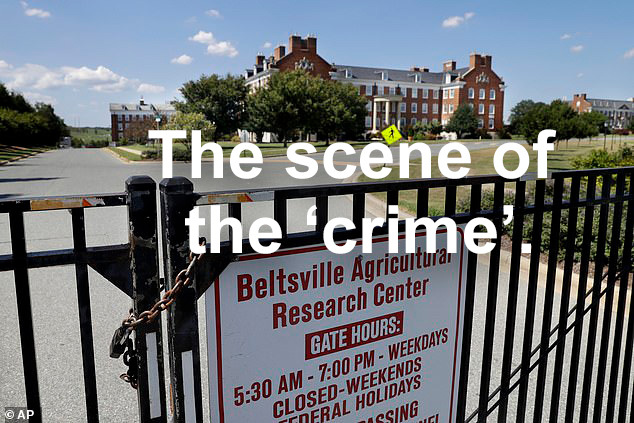 It is part of the US Department of Agriculture (USDA). 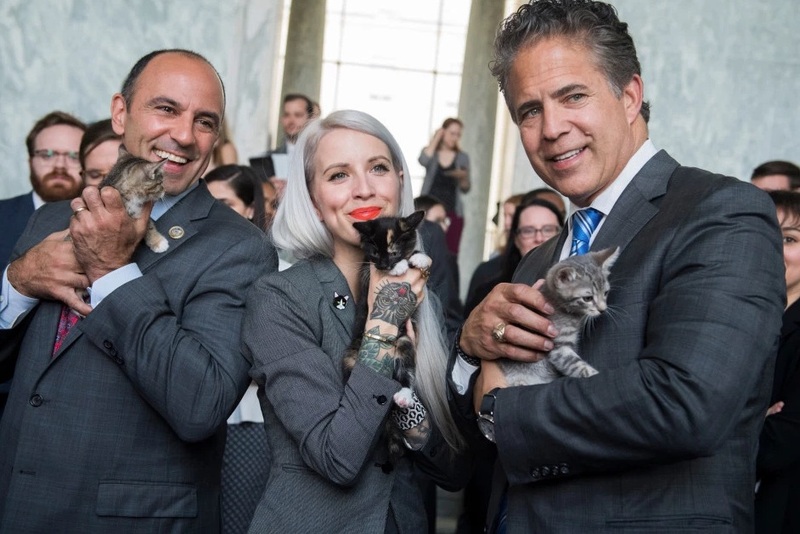 You may remember the sad and unpleasant story that went viral about the USDA using cats, young cats we were told, to research toxoplasmosis. It had been going on for a long time and the cats were euthanised and incinerated after they being used. Further uncomfortable information came out about this story such as the cats being euthanised with a shot of ketamine to the heart. This would have been painful. Overall US$650,000 of taxpayers money was spent annually on this unethical programme. The federal government was creating a law to ban it but it seems that the USDA have headed this off and precluded a requirement to change the law because they have stopped voluntarily. The USDA made an announcement on their website dated April 2, 2019. They say that ‘effective immediately at the recommendation of ARS scientists under the leadership of Dr Chavonda Jacobs-Young, the use of cats as part of any research protocol in any laboratory in ARS has been discontinued and will not be reinstated’. 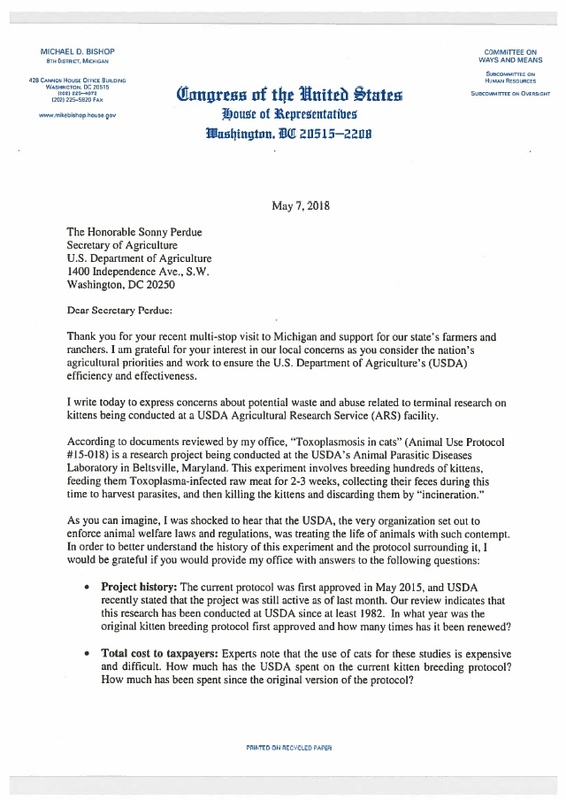 They also state (and I don’t fully understand what this means) that ‘USDA toxoplasmosis research is being redirected to other food safety research of high priority for agriculture’. I’m going to guess what it means. It probably means that they will use the money spent on the toxoplasmosis research on other forms of research of higher priority within their remit. USDA do not state that public and federal government pressure (through legislation) has brought about this change of attitude. They claim that their research has come to an end naturally because the project’s objectives for agriculture have been achieved. This entry was posted in good cat news and tagged animal law, animal rights, animal testing, cat abuse, Cat News, good cat news, research, USDA by Michael Broad. Bookmark the permalink. Yes, it is a good moment. There are some good moments in cat welfare.